When does creative courage slip into mental foolhardiness? To the public, actors are a source of both admiration and bemusement! Actors are praised for their vulnerability, raw emotions and ‘nakedness’ (figurative or literal). But for the many ‘jobbing’ actors there are also the judgements about “getting a real job” or “suffering for your art” or being treated by a director as a “warm prop”. The moments of fragility, of possible traumatisation in enacting intense roles, of frequent rejections at auditions, of shaming by family and friends who don’t take you seriously, of isolation when on tour, or simple exhaustion in having to work whenever you’re not acting to make ends meet – all these stresses – and more – can take an emotional and relational toll. I am one of the researchers of the 2015 national survey conducted with Equity, known as the Actors Wellbeing Survey. In that survey completed by 782 professional actors (both stage and screen), we found that Australian actors have higher levels of depression, anxiety and stress, and lower levels of life satisfaction than the general population. We also found that mature age was associated with less depression, anxiety, and stress, although life satisfaction remained at the same level. Income itself has little effect on psychological wellbeing, but a perception of being under financial stress was associated with more negative emotion and lower life satisfaction. Performers who took extended periods of time away from acting work reported more depression and less life satisfaction, but no difference from others in their level of anxiety or stress. These were just some of the findings from our study which we continue to analyses and report on. 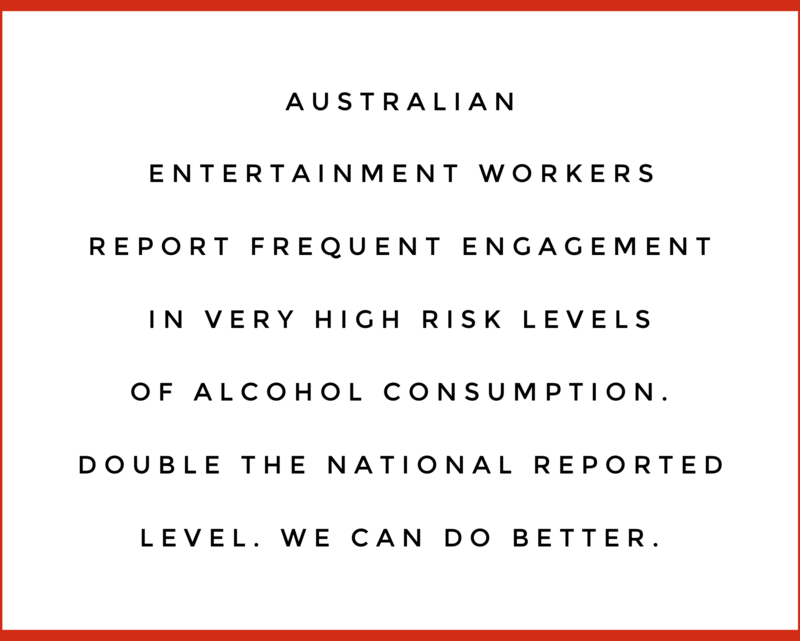 And in 2016, Entertainment Assist published its study on the health and wellbeing of all performing arts workers (i.e. not only actors, but musicians, dancers, circus performers, as well as technical crews and production staff).Of particular concern was the high level of suicide contemplation and attempts for both performers and crew that were many times higher than the general population. Such warning signs of mental distress have led to various State and national initiatives to take action and provide support and advocacy for performers’ wellbeing. In Sydney, on Monday 13th November, a Performing Arts & Screen Wellbeing Summit ‘How Can the Show Go On?’ is to be held at the Sydney Opera House. The summit has been developed by the NSW Performing Arts and Screen Working Group with support from Create NSW and industry. I encourage you to come and participate – show your support, share your stories, partner with us for change, and learn some practical skills to enhance your self-care and wellbeing. Dr Mark Seton is the founder of Sense Connexion, which he established to inspire savvy resilience in actors and other professionals whose giftedness for empathy and sensitivity is crucial to their effectiveness and success. Many such professionals are prone to compassion fatigue, burnout and even vicarious trauma. Over many years of research and experimentation, Dr Seton has developed a practical training program, called Resilient Vulnerability©, designed as a preventative tool to minimise such inevitable impacts. Dr Seton is one of the founding members of the Australian Society for Performing Arts Healthcare (ASPAH). In addition, he is a member of the Australian Alliance for Wellbeing in Entertainment (AAWE).